There will be high security in Portugal Friday, May 12, as the Pope flies in to join around a million Catholic pilgrims at the shrine of Fatima. The shrine was the scene of a sighting of the Virgin Mary 100 years ago. But what is the science behind such apparitions? On May 13, 1917 three children were watching over a herd of sheep belonging to their families. Francesco and Jacinta Marto and their cousin Lucia dos Santos were in an isolated rocky outcrop called Cova de Iria, near the small town of Fatima. They looked up and saw a lady dressed in white, who was glowing and "more brilliant than the sun." She told them she would see them on the 13th day of every month until October and that last occasion coincided with an incident where thousands of locals witnessed the sun appearing to "spin." The apparition became known as Our Lady of Fatima and the town became a shrine for Catholics from all over Europe and elsewhere. Today the Argentine-born Pope Francis will join around a million Catholic pilgrims for a two-day celebration of the "visitation." The Pope told Catholics he was about to present himself to the Virgin Mother. "In his message the Pope also said he is entrusting all Portuguese faithful to Our Lady asking her to "whisper into the ears of each one of them, and assure them that her Immaculate Heart is a refuge and a path leading them to God," a statement on the Vatican website said. Tragically Francesco and Jacinta both died, in 1919 and 1920, during the influenza epidemic which ravaged Europe. But Lucia became a nun and lived to the ripe old age of 97, dying in 2005. She always maintained it had been the Virgin Mary herself she had seen and she said the 2,000-year-old mother of Jesus Christ had given her and her cousins three prophecies. One of these was reportedly a prediction that the First World War would end soon — it did, a year later — and that a second great war would start during the reign of the next Pope "if men continue offending God and should Russia not convert." In fact the next Pope was Pius XI, who died in February 1939, a few months before Hitler invaded Poland. Jacinta and Francisco Marto, who were both illiterate, are to be canonized on Saturday, May 13 and Lucia is well on her way to being beatified. Lucia only began to reveal in detail what had occurred in 1942. She said the Virgin Mary conjured up a terrifying vision of hell, with a "great sea of fire," demons and human souls. Lucia said the Virgin Mary also called for the "consecration" of Russia, adding: "If my requests are heeded Russia will be converted and there will be peace; if not, she will spread her errors throughout the world, causing wars and persecutions of the Church." The third vision, which she only divulged in 1957 and was only made public in 2000, involved an angel demanding penance, then the Pope climbing a mountain only to be killed by soldiers firing bullets and arrows. There have been more than 1,500 visions of the Virgin Mary reported around the world in the last century but only nine cases have received the official approval of the Vatican. One of the most famous sightings of the Virgin Mary happened in the small town of Lourdes in southern France. But France is a famously secular country and last year a court in the town of Publier ordered a statue of the Virgin Mary to be removed from a public park. 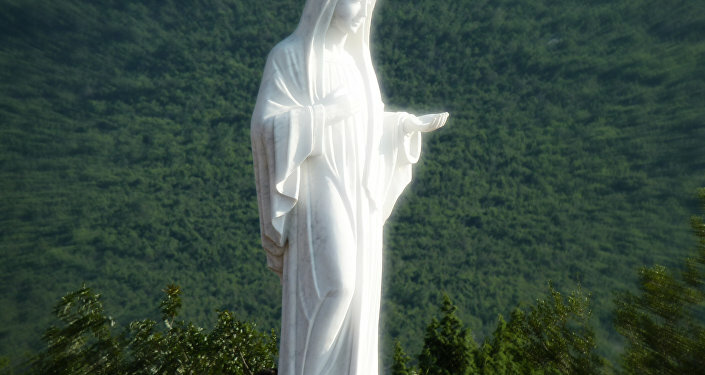 In 1981 the Virgin Mary reportedly appeared before six children in the countryside near the village of Medjugorje in Bosnia-Herzegovina. "You don’t need to believe in the visitation to be a Catholic. All you need is to believe that Christ came down to save us and died on the cross," Jack Valero, from Catholic Voices, told Sputnik. "Many people say they have seen the Virgin Mary but some could be fake and so the Church is quite skeptical when they first hear about it. Our lives are about helping the poor and preaching the Gospel, after all. "But the thing is about Fatima that these three children were completely illiterate. They had never read any books. When Our Lady starting talking about Russia they thought she was referring to an old lady who lived in the village," Valero said. He also pointed out that 70,000 people had returned on October 13, 1917 to Fatima and had witnessed the spinning of the sun. "Pope John Paul II was shot at close range on May 13, 1981 but the bullet passed through him without killing him. He said he was saved by Our Lady of Fatima and the bullet is now in the crown of Our Lady at Fatima."